CLEVELAND'S FIRST HALF LEAD FIZZLES IN LOSS TO BALTIMORE. A win, they say, is a win. Although the Cleveland Browns Week 8 win vs. San Diego looked ugly all around, the final score saw Cleveland on top. A week later, the Browns hoped to continue this momentum against AFC North rival Baltimore. Week 9's script started much the same. 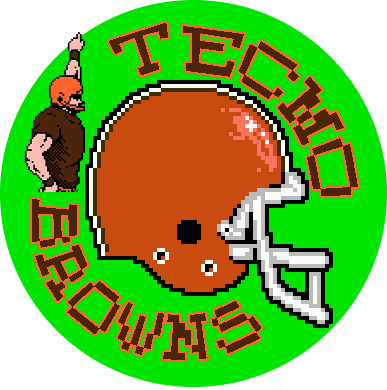 "COLD OPEN ON: a stout Browns defense, flummoxing the opposing QB and an offense sparking to life." Despite early efficiency from rookie QB Brandon Weeden, the Browns could only manage two first half field goals. The Browns' D nullified Baltimore's only real drive with a second quarter interception, holding the Ravens scoreless at halftime. This game, though, played like a Dickensian Tale of Two Halves. "It was the best of times [in the first half], it was the worst of times [in the second half]." After the Browns punted away the opening kickoff, Ray Rice turned He-Man and dropped a Castle Grayskull on Cleveland's D. In the second half alone, Rice ran for 152 yards and 3 TD. An ill-conceived onside kick early in the fourth quarter set up Baltimore on a short field. 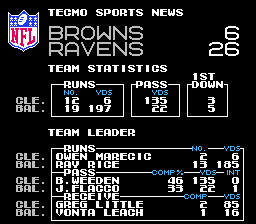 A Ray Rice TD run moments later put the game out of reach and a Brandon Weeden sack in the Cleveland endzone on the next series turned the dagger. The defense, taxed by an ineffective O and Ray Rice's second half explosion, offered little relief. Not really anything to extol here: Owen Marecic's 6 yards rushing? Weeden's 46% Completion rate?